SO...I HAVE A GOAT. LIKE MOST OF THE ANIMALS I INHERIT...IT HAS A STORY. SO, THIS IS THE STORY OF MY GOAT. SO TO MAKE A LONGER STORY SHORT... THEY LOADED FEED AND A BOX..WITH A GOAT IN IT..INTO MY CAR AND SAID THE MAN SAID TO HAVE A MERRY CHRISTMAS. YES MERRY IT HAS BEEN. I STARED AT THIS GOAT ALL THE WAY BACK HOME...IT SAT NEXT TO ME IN THE CAR. I HAD TO LOCK IT IN MY BATHROOM TILL BRANDON GOT HOME TO BUILD IT A PEN. I'M NOT SURE HE WAS TOO EXCITED WHEN I CALLED HIM AND TOLD HIM I HAD A GOAT IN THE BATHROOM THAT NEEDED A PEN. BUT REGARDLESS..A PEN WAS BUILT. AND THE GOAT ONLY ESCAPED THE BATHROOM TWICE WHILE IN IT. TOOK ME 30 MINUTES TO CATCH IT...MAN THOSE THINGS ARE FAST! AND THEY JUMP! 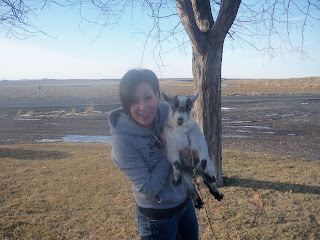 SO NOW OUR GOAT HAS A NAME...BELLA. SHE LIVES IN A MAKESHIFT IGLOO NEXT TO THE RABBITS BEHIND THE HOUSE. MY LANDLORD DOES NOT KNOW...HEAVEN HELP ME WHEN HE DOES KNOW. SHHH! :) FUNNY THING IS LATELY BELLA HAS ESCAPED HER PEN. AND EVEN FUNNIER WHEN SHE DOES SHE SITS ON THE BACK PORCH AND WAILS LIKE A BABY. THEN WHEN I GO OUT SHE RUNS BACK BEHIND THEN HOUSE AND INTO HER PEN. WHENEVER I HEAR HER WAILING I JUST LOOK OUT THE DINING ROOM WINDOW AND SURE ENOUGH SHE'S SITTING ON THE PORCH CRYING FOR ME. ONE NIGHT SHE MADE ABOUT SIX LAPS AROUND MY HOUSE..WITH DOGS BEHIND HER...BEFORE WE CAUGHT HER. WE TIED HER TO A TREE THE OTHER DAY SO THE KIDS COULD PLAY WITH HER. SHE BALLS LIKE A NEWBORN UNTIL YOU PICK HER UP AND THEN SHE STOPS AND JUST STARES AT YOU WITH THESE BIG GLASSY BEADED EYES THAT ARE MOST LIKELY SAYING, THANK YOU FOR RESCUING ME FROM THAT PEN AT THE FEED STORE...I'M SURE IT'S SOMETHING LIKE THAT. SO...MY LOVE OF LIVING IN THE COUNTRY IN AN OLD HOUSE IS DEFINITELY TESTING ME LATELY. I HAVE DEFINITELY LEARNED A FEW LESSONS THIS TIME AROUND. #1 DON'T TAKE YOUR KIDS TO THE FEED STORE..ESPECIALLY WHERE NICE MEN MIGHT BE WAITING TO BUY YOU SOMETHING! #2 DON'T EVER EVER EVER TELL YOUR KIDS YOU'D BUY IT IF YOU HAD THE MONEY...CAUSE ONCE AGAIN YOU NEVER KNOW HOW MANY NICE PEOPLE ARE JUST WAITING TO SPEND THEIR MONEY ON YOUR KIDS! #3 WHEN YOU LIVE IN THE COUNTRY EXPECT TO HAVE PEOPLE DUMP THEIR UNWANTED ANIMALS ON YOUR PORCH AND EXPECT TO HAVE LOTS OF ANIMALS CAUSE IF YOU LIVE IN THE COUNTRY YOU MUST LIVE ON A FARM! ??? #5 EXPECT THAT EVERY ANIMAL YOU BRING HOME..OR TAKE IN AFTER SOMEONE DUMPS IT...EVEN IF IT STAYS OUTSIDE...THEY IMMEDIATELY ASSUME YOU ARE THEIR MOTHER. AND THEY WILL CRY FRIENDS...THEY WILL CRY FOR YOU AND YOU WILL PICK THEM UP...EVERY ONE OF THEM...BECAUSE THAT'S WHAT MOTHERS DO. AND EVERYONE NEEDS A MOTHER. EVEN IF IT'S NOT THEIR OWN. Thats hilarious and I'm amazed at the generosity. Just think you may not have dogs soon to keep you company, but you'll have that little goat. Thats such a good story. Hey...you didn't tell us the story, that is too funny :)What a great gift, I think??? Or is the gesture that counts ;) Love her name by the way! holy freaking crap. That is the cutest goat I have ever seen. I have wanted a goat for like 10 years. Just ask Stephen. Every summer I ask him for one and he looks at me like I am an idiot and he promises that one day when we have a bunch of land and a barn to put it in he will buy me a goat. Dang it. I wish I lived on a farm! That is so wonderful that that man bought you a goat!!! That was so great. Seriously. Wonderful name, Miss Bella. 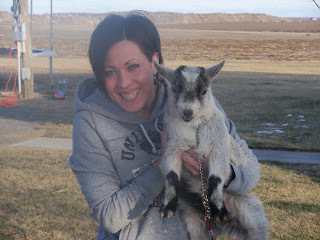 Can I bring my kids over in a bit when it is warmer and see you goat? wow congrats on the new addition to your family. I think you should find this man, and return the favor someday, like give him one of your dogs or your cat....hehehe..
seriously super nice guy though that is great story to pass on. hope you are doing well. Wow that is awesome. We always wanted goats. My mom will be sooo jealous. :) What a nice guy! Well if you ever get tired of her you can take her out to my parents to visit their new pot belly pigs. Reminds me of raising Stephanie, we never knew what we would come home to. The Grandma question, who gets to babysit the cute little feller, Mary? So this story was funny when you called me about a doghouse, but it's even funnier when you post about it! I LOVE IT!! What a great story! The goat looks so happy to have you for a mother!